Maybe you didn’t see the story last week, but one of our local community gardens had about 300 onions stolen. Why on earth would you steal 300 onions (that weren’t even mature) from a community garden? We see some thievery here at the Demonstration Garden on a fairly regular basis, but we assume that losing a tomato here or there is just the way things go with a garden that is open to the public 24/7. However, even we have been seeing a drastic uptick in theft from our garden. So far this year, we estimate that we have lost about $350 worth of plants, potting soil, and hoses from our garden, which is something that hasn’t happened before. We also saw pretty regular harvesting of spinach, lettuce, chard, beets, carrots, and onions both last fall and this spring. Seriously!?! This is getting ridiculous. Ironically, the theft at the Delano Community Garden occurred not long after the Wichita Eagle posted this cool map of all the community gardens in Wichita. The number of community gardens continues to grow, which is really exciting! I just hope that the theft and vandalism doesn’t keep people from starting new gardens. In other, more exciting news, we have a small harvest from the Family of 4 Garden today! We also harvested some peppers from the pepper garden and a patty pan squash from the Smart Pot. I had to debate a little bit how much that pepper is worth. You can’t buy purple peppers in the grocery store, so there’s no good comparison. 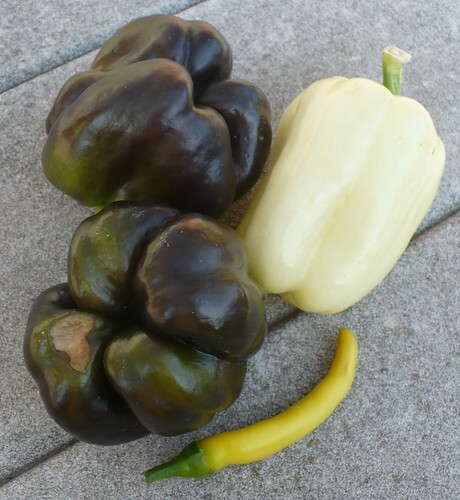 However, other colored peppers are an arm and a leg – anywhere from $1.50/each to $3.00/each. A purple pepper probably ranks up there pretty high, but this pepper was also really small, compared to other peppers. So, I decided to stick with the $1.25/each. Posted on July 5, 2011, in Around the Garden, Family of 4 Garden and tagged gardening, harvest, peppers. Bookmark the permalink. Leave a comment.